As a slight aside from the investigation into Transmission Gully and it’s dubiously planned Link roads, I thought I would go back in time. Back, indeed, to the time of Bill Sutch, back in time to even before the current Wellington Foothills motorway was built. Long time ago, I know. That sort of sums up his general philosophy. 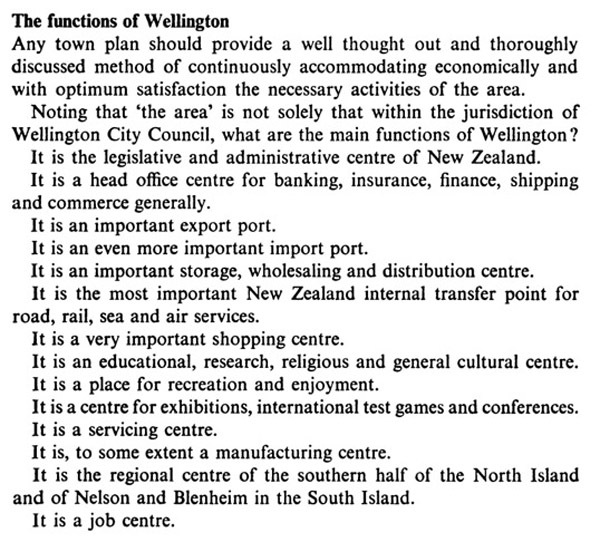 Then comes a discussion of Wellington’s issues: Things to consider in a Town Plan. Some of the population numbers are about the right amount, some others are way off. Ohariu Valley 30,000 ? Where did that come from? But tied in with that, is a proposed rail link between Paremata and the Hutt – the PT version of the proposed link road being discussed today. 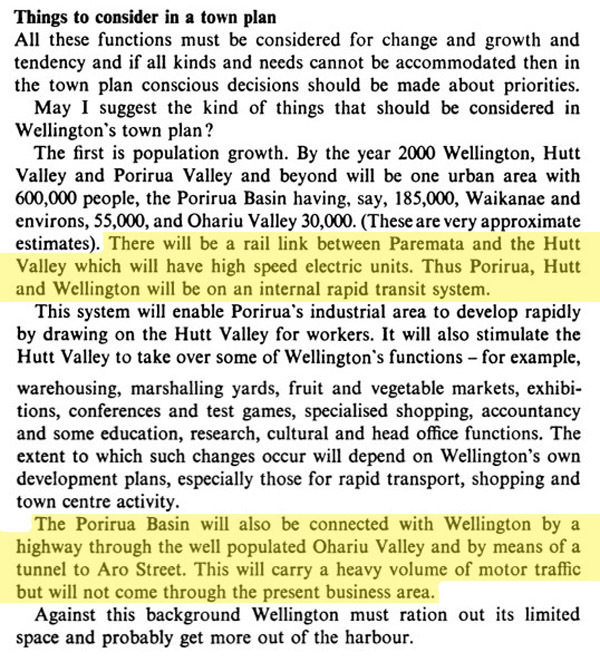 I’m intrigued with that other highlighted bit – Porirua via Ohariu through a tunnel to Aro St. Was this ever a serious proposal I wonder? Sutch was, of course, famous for meeting a Russian agent – in the Aro Valley was it? What I find intriguing is the writing of this booklet just before the motorway came to town. As described, most of it is correct. Below, I think the point about Lack of Consideration is still just as valid now as then. Why do we need a motorway right to the end of the island? Where do all these people come from? 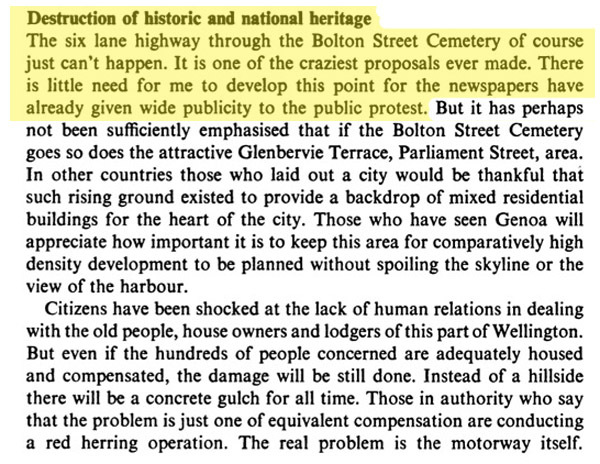 Putting the motorway through the cemetery… he describes as “…one of the craziest proposals ever made…” – and yet it happened alright, whether warranted or not. 1. That an elevated motorway along the waterfront was a bad idea. Indeed. 2. That the day you finish building the motorway you start building the underground railway extension. The railway was proposed to branch off just north of Wellington Station and head underground through Thorndon, along the Terrace, through the CBD and terminate near the Basin or the Hospital, with about 4 intermediate stations. Hot. “Porirua via Ohariu through a tunnel to Aro St”? I remember seeing somewhere a plan for a tunnel through from the top of Aro St – around Entrance/Norway St.. (might have been the top of Norway St?) and popping out somewhere near the horseshoe bend on the Glenmore St (the bend after you go under the Viaduct, heading towards Karori). Interesting how so little has changed in the “master-plan” for the motorway since 1960. It traces the exact route of the inner city “bypass” in Te Aro (albeit underneath the local roads).. and through a new Mt Vic tunnel. Has nobody had any NEW ideas since then? I think this was called the “north-west connector” and the DLC report referred to it – but I think it was a Council idea. And before then the Council was thinking about two tunnels – from the top of Aro to the Glenmore hairpin and another from there to a big roundabout on Appleton Park. 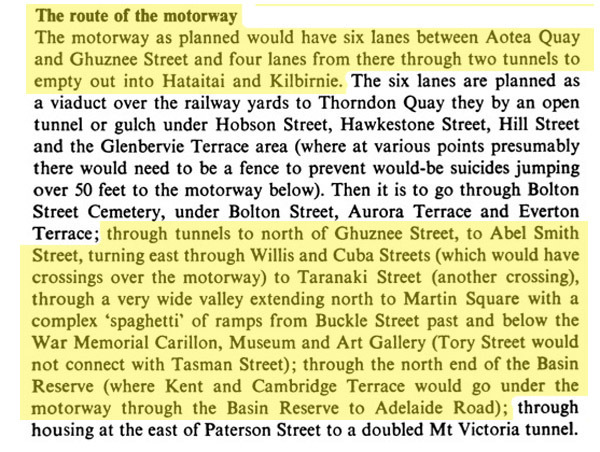 And even earlier, there was a tram tunnel idea – Karori to town via Aro Valley (another long tunnel). 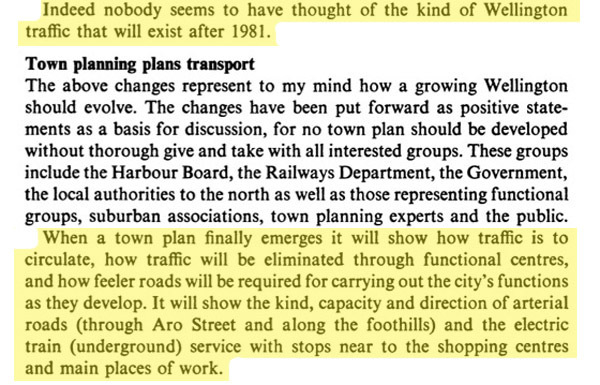 So a guy who saw Wellington 50 years ago could design a better transport solution for Wellington then, than nzta can in the present tense, says a lot really..
No, Sav, that’s not quite right. Sutch was, for the most part, only quoting from the published sources informing what the motorway was going to be. The map, although from his book, is presumably directly from a MoW plan at the time. 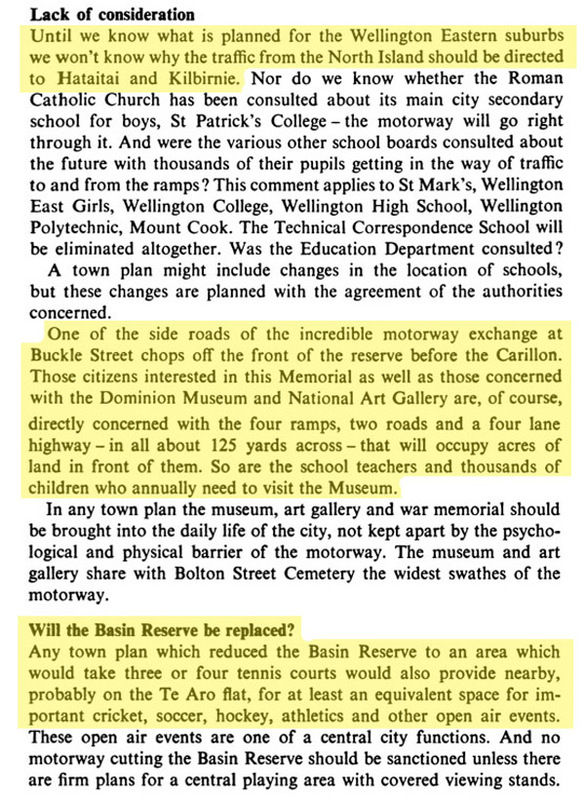 All the comments and proposals for the motorway are also directly what the MoW had planned to build, in the very near future (back then). Most of this has come to pass already. St Pat’s college has moved from where it was (where the War Memorial Park underpass is being constructed at present) over to Kilbirnie. The Creche of Compassion is all that remains of the catholic buildings that were there – right next to the Creche was a Home for the Incurables… a nice way to say you’re on your way out buddy! Of course, the one thing that has not be implemented is an electric underground train system, and arguably, the watered down piss-weak Bus Rapid Transit proposal is our answer to that. Sad. Fascinating stuff, Maximus. There seem to have been so many proposals for infrastructure projects in Wellington’s history (some madder than others), that have never come to anything. I was reading recently about plans for shops in bubbles in the sea at Petone.